Escondido Mayor Sam Abed claims SANDAG’s ballot measure allocates too much for public-transit projects in San Diego and not enough for highways in North County. While it’s true that increased transit funding is more beneficial for dense San Diego than suburban Escondido, transit dollars are still useful for North County. Statement: “The new proposal from SANDAG … 14 percent goes to freeways and 40 percent goes to public transportation. … Public transportation is good for San Diego. It’s not good for a suburban environment in North County. North County is – what – a third of the county, 1.2 million, and we need to get our fair share of taxpayers’ money,” said Escondido Mayor Sam Abed, at a District 3 county supervisor debate on April 21 in Rancho Santa Fe. This includes two North County mayors battling to become the next county supervisor for the northern coastal district, Escondido Mayor Sam Abed and Encinitas Mayor Kristin Gaspar. It also includes County Supervisor Bill Horn and Poway Mayor Steve Vaus, who both voted against putting the measure on the ballot. In an interview, Abed said he is concerned that shifting spending toward public transit in central and southern San Diego could leave North County highways in long-term trouble. But his fair share argument – and that of other opponents in North County – lacks important context. The dollars from the tax measure are being used to fill a funding gap in SANDAG’s $204 billion long-term transportation plan. It’s meant to make up for a lack of funding from federal, state and local sources for specific projects included in the 40-year transportation plan that was approved by SANDAG’s board – including a “yes” vote from Abed. The tax measure and transportation plan don’t delineate spending by parts of the county. But the projects in the tax measure are not the only improvements North County is slated to receive in the next 40 years, nor is it all of SANDAG’s funding for transportation projects. It is one part of a piecemeal funding approach to implement the long-term plan. If voters approve the tax, there shouldn’t be a highway funding gap for projects in the plan. For example, planned improvements for the North County highway SR-78 will cost about $1.2 billion. About $566 million of that is coming from SANDAG’s existing sales tax, TransNet. SANDAG needs another $650 million– which it hopes to get from the new tax. But this doesn’t mollify Abed. He doesn’t like that the measure fills funding gaps for already approved highway projects, but pays for completely new transit projects, like the trolley’s Purple Line from San Ysidro to Kearny Mesa. Abed supported the transportation plan, which included new transit projects like the Purple Line, but he says the tax measure crosses the line. Abed’s big concern is that the tax measure’s breakdown signifies a larger shift away from highway investment to more concentrated public transit investment. North County projects make up about half of the highway initiatives in the tax measure, with improvements to the 56, 78 and the North County corridor of the I-5. Improvements to the 78 corridor, carpool and express lanes on the I-5 and adding a second track to the Coaster rail line are all North County projects SANDAG is fast-tracking. And North County does get some transit funding. The region would benefit from Coaster double-tracking, for instance, one of the largest transit projects in the plan. But there are only about six specific North County transit projects out of a list of nearly 50 projects. North County Transit District could potentially receive just under $600 million toward projects that are estimated to cost a total of $1.1 billion. This doesn’t include some initiatives, like those for parking at transit stations, improvements to fare systems and customer services, vehicle replacement and enhanced bus services, or projects surrounding station areas. Those funds could end up benefiting transit services in North County. SANDAG produced multiple proposals for how to spend the tax money before the most recent version that was voted to be placed on the ballot. That version cut new bus routes for North County – from Carlsbad to Escondido and from Oceanside to UTC – and redirected those funds to upgrade and improve existing Coaster and Sprinter services. But while it’s true that increased transit funding is more beneficial for dense San Diego than suburban Escondido, transit dollars are still useful for North County. That’s because Abed’s statement misses a broader point fundamental to regional transportation planning: North County residents don’t live in bubbles. Many residents of Oceanside, Escondido, Encinitas, San Marcos and the rest of North County’s cities work in central San Diego. In Abed’s Escondido, for example, 82 percent of employed residents commute out of the city to work, according to SANDAG data. In Oceanside, 81 percent of residents work elsewhere. In Vista, 85 percent. In Encinitas, 87 percent. In San Marcos, 88 percent. In Poway, 90 percent. That means improvements in Sorrento Valley, La Jolla, Kearny Mesa or downtown San Diego can also benefit people who work there but live elsewhere. In San Diego, though, 64 percent of residents both live and work in the city. And North County isn’t exceptional. In Chula Vista, 82 percent of residents commute out. In La Mesa, 92 percent of residents work elsewhere. Countywide, the majority of employed residents – 69 percent – work outside of the city in which they live. The city of San Diego is the only exception, where only 36 percent leave for work. That’s the essence of the problem with Abed’s statement, and with others who claim their part of the county isn’t getting its fair share: It’s wrong to assume money spent on transportation and mobility in San Diego only benefits San Diegans. Abed says he understands Gallegos’ point – that the idea is to think of the county as an entire region, rather than one pieced into separate parts. In fact, he says he agrees we should look at the entire efficiency of transportation infrastructure regionally and not in silos, and that easing congestion in job centers like Sorrento Valley will help North County commuters. Regardless, he sticks to his point. “That will help, but it won’t address the needs of the 56 and the 78,” Abed said. We say a statement is a stretch if there’s an element of truth to a statement, but it omits critical context that alters the impression it leaves. That’s the case here. Abed is right: SANDAG’s tax would spend more money in central and southern San Diego than in North County. 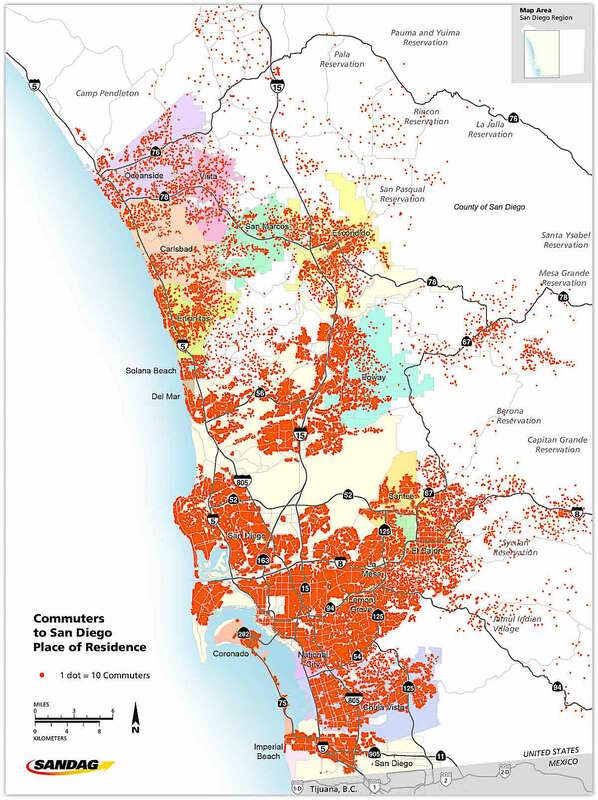 But he’s ignoring that most North County residents are commuters who work outside the cities in which they live. Those taxpayers will be regular users of the projects built outside their cities. Be the first to comment on "Fact Check: North County Wants Its ‘Fair Share’ of SANDAG Tax"